The supplies are purchased and ready, and we’re devoting Thursday to clothes. Ugh. Not my favorite. First we spend an inordinate amount of time shopping in the closets for hand-me-downs. 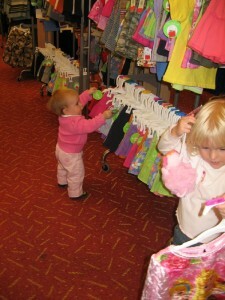 For years we were able to coast almost entirely on hand-me-downs and Grandma’s shopping trips. These days the girls are a bit pickier. I feel like they only actually ever wear about one-third of the items in their bureaus, but when I try to clear out, they’re certain that they’ll want to wear the neglected items any minute. Just not, like, today or tomorrow. Meanwhile, there are always gaps in the wardrobe to be filled, and since both girls are going through growth spurts, there will be some shopping. It’s not my favorite (in fact, pretty much everyone on my side of the family would prefer to order online). But from an early age it was apparent that the girls take after Grandma.